Let's check its details and be a professional. After read this page, you can distinguish from Vintage and Replicated at a glance. The biggest feature is eye color. Vintage one is very brilliant, but Replicated is not so enough. The cause is its mechanism. So the customizing eyes for replicated blythe is the most popular. First, take off eyes, then set a brilliant paper, and attach eyes again. This kind of customizing is called 'Kira Me'. ( It's the Japanese word, means brilliant eyes ). You can make your Blythe more charming to do this. One question, I can't imagine why Vintage blythe was sold with brilliant eyes, and why replicated blythe doesn't have one. Nowadays, the technology is grown well, there's no barrier to make her eyes brilliant. Vintage:left above, Bohemian beats again:left bottom. There's other feature for Vintage Eyes. Eyes angle and eye hall. First, the angle of her eyes. Vintage eyes can move to corner deeply, but Replicated is not enough. The cause is its specification. Eye spec has changed before All Gold in One and After Aztec Arrival. Vintage is the best one that its eyes can move deeply. Next, before All Gold in One, and last, After Aztec. I have no idea why they, the producer changed like this, but this is the fact. You can see the photo lefted and understand easily its differencies. By the way, before All Gold in one, its eyes open widely. We call it 'Pachi Me' ( means open widely ). But the same time changing eye spec after Aztec, eyes changed not so open widely. We call it 'Toro Me' ( closed a little ). You can find from the photo lefted. Middle, Hollywood, only her eyelash is up. And eyehall, there's a little bit differencies. In general, Vintage one is the largest. Its is like a triangle. But Replicated is like a ellipse. 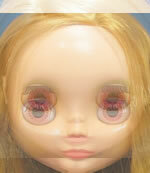 Some people enlarge her eyehall to close with Vintage Blythe. Next, have a look at her hair. Understanding replicated blythe more and more, and then, we realize there's no Blythe with her hair like as Vintage one. Vintage hair is more coarse and replicated one is flexible. Usually vintage hair became a bunch, so I sometimes see vintage hair which was set up curiously. Vintage's eyelash is thick than Replicated one. Some of Blythe fun change her eyelash to thick one. It's also common sense to customize their blythe. 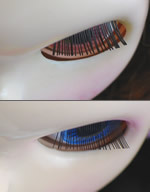 If you cannot find an eyelash for doll, don't worry. You can use a human's eyelash with no hassle. Get a fuman's eyelash and attach it. It's also easy to attach and quite effectively, especially taking her photo. How about her ears? The glasses was sold as a option for Vintage Blythe, so Vintage Blythe has a hall on her ears. Replicated Blythe has a hall for piercing, but no hall for glasses. And her body, 'Excellent Body' was adopted after Miss. Anniversarry and it is quite as same as Vintage body. Before Anniversarry, Replicated Blythe was sold with Ricca doll's body and Ricca body is quite different from both Vintage and Excellent body. Ricca doll is based on the Japanese girl, and Blythe is based on the American. It's understandable why their body is so different. Please refer Differences their body to understand their body. Sorry Japanese only at this time. Let's see their back. Vintage has a sign 'KENNER'. Replicated has a sign 'TAKARA'. There are 2 signes for Vintage Blythe depending on when they were sold. You can find 6 lines and 7 lines from the photo lefted. And last, it's the most important, and I can't explain correctly very much. Its face shape, and layout for their parts, eyes, nose, mouth, and something like that. Note: There's several faces around Replicated Blythe. I think evenif Vintage Blythe have. To say ' comparison between Vintage face and replicated one', it's not enough to compare whole Vintage face and Replicated one. 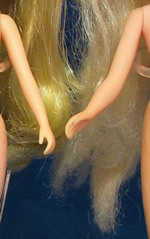 So I picked up some of them, Blonde Vintage and Replicated Blythe 'Nike'. At least replicated blythe has several faces. For example, too glossy face, mat face, glossy-widebottom face, and glossy moderately. And I could say deeply the differences caused 'lot'. For example, 1st Skate Date is little bit different from 2nd Skate Date. Let's see their differences. I mentioned the differences for their eyehall above. And any other else, I wanna see their face. You can find that height of Vintage face is little shorter than Replicated, and width of Vintage face is little wider. And her forehead, Vintage forehead looks like more rounded than Replicated. I don't have a good skill to explain this in English.. Replicated's forehead is little bit straight than Vintage. So if we see their face in front of them, we feel Vintage face is smaller than Replicated becauseof the corner of their foreheas has a different angle. Their cheek would be different. Replicated is more plump. And the line from jaw to cheek, Vintage's one is more rounded than Replicated. Nike:left, Vintage:right. Adjusted bottom of lip. Next, look at their parts. I overlayed Vintage picture on Replicated. Above is Vintage and bottom is Nike. You can see the differences for size of eyes and eyehalls. Each parts are bigger than Replicated. The gap between eyelid and eyes is quite short for Vintage, but Replicated is longer. Mouth, Vintage mouth is smaller, and the side of mouth is up. I tried some experimence. I hide vintage's eyes and changed into black-white to flatten the differences their makeup. Although its differences is disappeared than before, I could distinguish them. I wanna say that not only eyes and makeup are the important factor, but also face outline is important as well. Reading above, and I wanna say you are a good vintage master. But you are just standing a start line. Remember I mentioned above and surf a lot of other Blythe site, you could be able to a professional. You can find another attraction of Blythe!